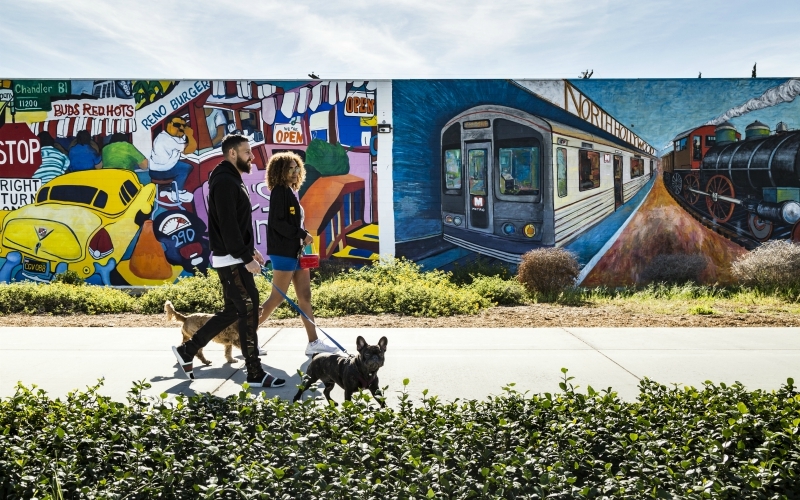 A couple walks their dogs past murals along the Chandler Bike Path in North Hollywood. Angelenos who think of the San Fernando Valley as car-bound and culture-free haven’t been over the hill in a while. Pockets like North Hollywood’s Arts District and Burbank’s Magnolia Park are urbanizing fast, making for some wonderfully walkable neighborhoods. Take the Red Line or drive to the North Hollywood Metro station and amble west toward Lankershim Boulevard. Stop at bank-turned-gastropub the Federal, sample the area’s galleries, and hit Republic of Pie on Magnolia Boulevard for a sweet slice. Vineland Avenue is a little ways on; a left leads to the mural- and tree-lined Chandler Bikeway and used-book mecca the Iliad. In another mile or so, you’ll hit North Hollywood Way. Turn right and walk a block to Burbank’s Magnolia Park neighborhood, where you can scope outfits at Junk for Joy, check out the occult merch at the Crooked Path, and then reward yourself with a sando at Porto’s. If you’re not up to hoofing it back, a Green Line bus can do the job for you.